The Philadelphia 76ers welcomes a new player to the team! 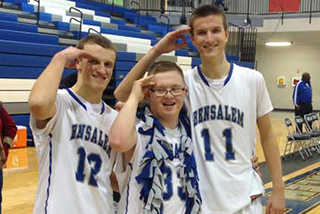 The Sixers announced that they have signed Bensalem High School senior Kevin Grow to a ceremonial two-day contract. The contract was offered in-person by Sixers President of Basketball Operations & General Manager Sam Hinkie. “After he signs his two-day contract, Grow will eat dinner in the players lounge, tour the practice facility and receive Sixers gear. He will join the team on the floor toward the end of practice, meet and shoot around with his new teammates, be greeted by his coaches. We are so proud of you Kevin Grow, you are truly an inspiration to us all!